Five years in the making, A People?s Curriculum for the Earth is a collection of articles, role plays, simulations, stories, poems, and graphics to help breathe life into teaching about the environmental crisis. The book features some of the best articles from Rethinking Schools magazine alongside classroom-friendly readings on climate change, energy, water, food, and pollution?as well as on people who are working to make things better. 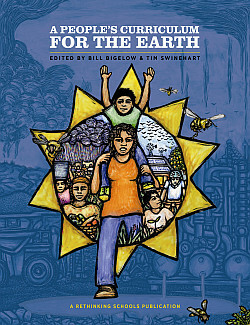 A People?s Curriculum for the Earth has the breadth and depth of Rethinking Globalization: Teaching for Justice in an Unjust World, one of the most popular books we?ve published. At a time when it?s becoming increasingly obvious that life on Earth is at risk, here is a resource that helps students see what?s wrong and imagine solutions.